And then it slaps you again, to remind you who's boss. Miserable little flakes like winter's dandruff sift down for days, the wind finds its way where you wish it wouldn't, the miserable dishwater clouds scudding across the sky like they're embarrassed to be there. It's easy here, compared to many places. Near the ocean in the Northeast is fairly mild, winterwise. People in Minnesota must laugh when they hear us bleat about 35F and cloudy. But Three Card Monte weather only needs to wear you down. It doesn't need apocalyptic fury. Many a housewife eyes the kitchen knives when the Santa Ana Winds blow too many days in a row. I'd kill for ten minutes of that right now. To each his own. But I am refreshed, and wish to share it, if I might, with my internet friends. 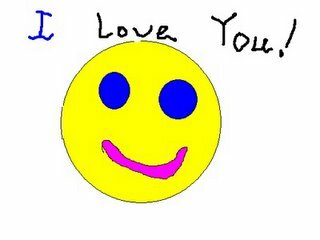 I was cleaning my virtual desktop, and stumbled upon this trifle, drawn with love and care by my older son for me when he was very small. Such things are personal, perhaps, and not transferable, maybe, but I'll offer to share it on the off chance that you too need a smile, like this portrait derived from a heart untainted by even the remotest hint of malice or calculation or pretension. It's not sophisticated. No matter. It might be enough to carry me to spring. How about you? I have a friend who says of things like that, "You can't buy it at the store!" You cannot indeed buy the love, trust, and joy wrapped up in that little doodle. So enjoy it. And thanks for sharing it. You made me smile. Unavailable in any store and you can't buy it neither!